This swap has been in the works forever... Many thanks to Claire at beautyandlechic for being so patient:) Claire's blog was one of the first blogs I started following and loved her style, makeup and well, her blog! 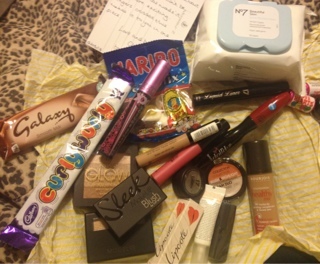 She's beautiful and has a love for mascara and blush- I knew this swap was doing to be good! 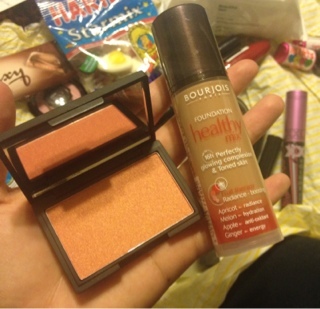 One of the items I did specifically ask for was the Bourjois Healthy Mix foundation- as I'd seen it everywhere! So excited to own it and also another UK blogger favorite - Sleek Rose Gold blush. Just a quick post/pictures of the swap- since I'm still playing with it all! Sleek Gold Rose Blush, Bourjois Healthy Mix Foundation "58"
Wooww, I love love sleek and bourjois!!!! Oh I love this foundation, really liked it. Will be eagerly waiting for more.